The Mirabella Family of Sicily came to the United States over a century ago, bringing with us our passion for life expressed through gourmet foods and camaraderie among our family, friends and neighbors. My mother Milli Mirabella remembers her father, Peter Leonardo Mirabella, often in the kitchen of their New Jersey home, making up caponata and other Mediterranean masterpieces from scratch. In the early 50's Milli had migrated here to California. In the 60's, long before signing up for little league, I can remember mom making baseball sized meatballs to serve with her famous spaghetti dinner. 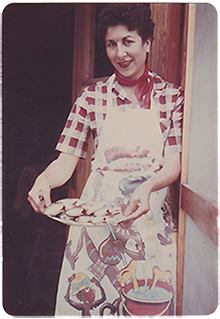 It was her continuous creative Italian cooking that inspired and helped influence me in taking a cooking class in seventh grade. I continued cooking classes through 8th grade, then in high school, and never quit cooking since. In 1994, five generations from when my great grandparents first came to the USA, our children would occasionally come home from school with a cough, sniffle, or sometimes worse. As parents we would reluctantly catch something from time to time. I’d always believed in incorporating a Mediterranean style diet and other known immunity-building vegetables, herbs, and spices into my diet to help ward off any such liabilities. Garlic, onions, peppers, strong mustards, oregano, basil, and thyme, were commonly used in our kitchen. One winter after catching something that was more aggressive, I decided to put to use a little of the insight I had learned from our family heritage and traditions. As opposed to simply adding more garlic in our routine daily recipes, I went for the gusto and cooked up some garlic à la carte with extra virgin olive oil. Since then we've come a long ways. Our quest has always been to deliver the world the utmost finest of garlic products. Being here in California provides us an abundance of some of the best produce available anywhere. We keep committed to our original quest by not cutting any corners or doing things the cheaper way. You will taste this level of quality and commitment in each and every one of our authentic GARLICCI products. It's not just garlic, it's Aglio di Mirabella.